In an auditorium full of bright and budding students, words went forth like scattered seeds. These seeds—I believe—will germinate and bourgeon into strong trees of change. Propel launched at Liberty University in Lynchburg, Virgina, thousands of students and thousands more online. And this is just the beginning. 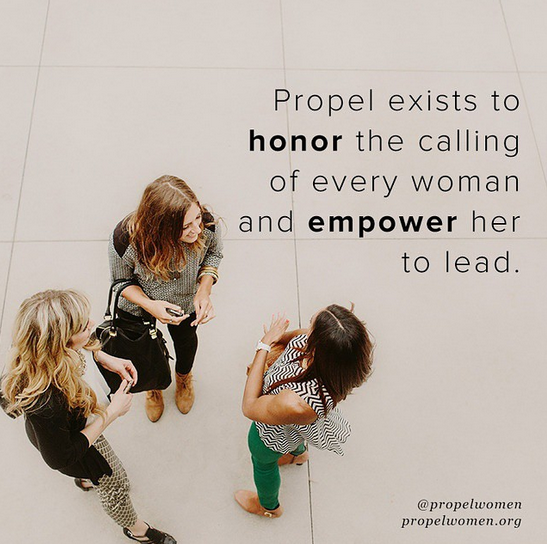 Propel isn’t movement of angry, ax-wheeling FemiNazis, but an initiative that celebrates the latitude of womanhood and provides resources for personal leadership development. With over 60% of women in the workforce, we don’t want to the Church to hide from the secular space. The goal is to equip women with Christ-centered truths to navigate in this world. From Christine Caine to Beth Moore, this week has been packed with some of the best wisdom I’ve heard in a while. But at the end of the day, or at the end of this launch week, our primary passion is to lead people to Jesus. We aim to make Jesus’ last command our first priority. I can’t wait to share some of the resources we will have available online and at gatherings around nation. We just launched our SECOND digital magazine that you can download for FREE, as well as phase one of our website with articles and videos available. Check it out and get more info! Here’s a peek at a video just posted this week! Make It Work from Propel. So bummed I couldn’t get the stream link to work but the tweets made it sound amazing! I love the Mission and Vision of Propel and the magazine is awesome!!! I read them and steal all the nuggets I can get and apply them to the place i am planted right now! I’m soo excited that Propel exsist and can’t wait to see what awesome stuff God is going to do through you all!!! WHOOT WHOOT! I love the propel magazine and everything I have seen so far! I am in preparation phase and being equipped to build the kingdom in a secular world. I’m so grateful that God has called you to launch Propel to minister to women. Thanks for your hard work! Prayers for the success and lives of the women touched by this new initiative! WOOHOO! So grateful for your words and excited about your future. Wow! I’m so excited to start the curriculum in Switzerland… Soon we will have many women getting involved and living their calling! Thanks for all your effort and passion for this project!